Here is the replay of the Essential Steps To Find Your Readers And Build Your Author Platform webinar. 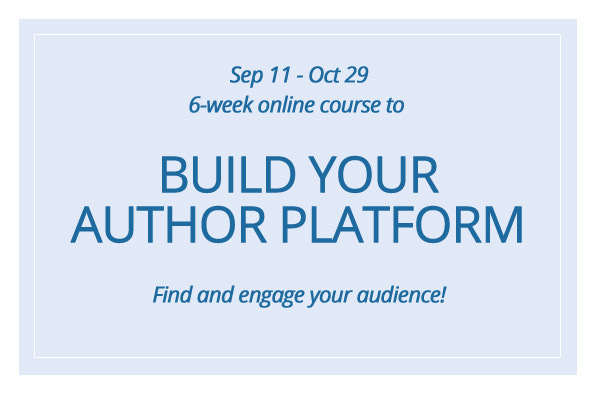 Below, I also outline my 6-week online course which begins on Sept: Build Your Author Platform. Find and engage your audience! This 6-week online course will help you craft your author platform, discover who your ideal readers are, and specific ways to captivate them, even before your book is published. Too many writers publish books that do not get read. 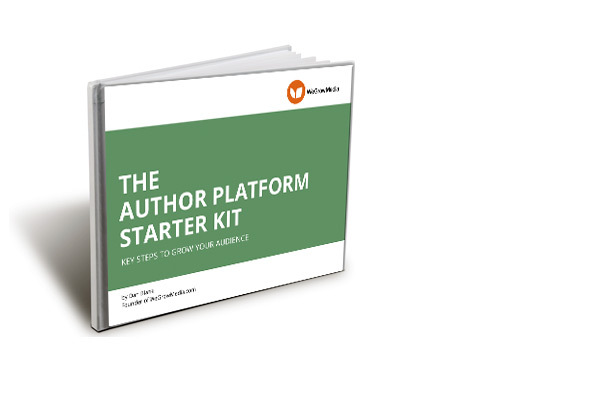 Developing an author platform gives you the skills you need to ensure your book gets read. It becomes the foundation for knowing exactly where to find readers, what gets their attention, who you need to know, and how to ensure that your readers take action: buying books, leaving reviews, and spreading the word about your books. Find out what bestselling authors know about book marketing, leveraging social media, and developing an author platform that feels meaningful, not promotional. Join me and a group of writers for a 6-week online course from September 11 – October 29 that will build the platform you need to establish an audience for your writing career. Are you a writer who is passionate about your work, but find it difficult to build an audience? What you need is an author platform – a strategic way to communicate your purpose to the world and establish trust with those who can help make you a success. I have trained hundreds of writers to extend their reach in powerful ways – increasing audience size and engagement. Inherent in this is establishing a manageable process where you do more of what works, less of what doesn’t, and balance the craft of writing with platform development. Laser-target who your ideal audience is. Find out – specifically – where you can find them online and off. Discover what engages your readers and who can help you access them. Create the messaging that describes your work, and taps into the deepest needs and passions of your target audience. Set up your author platform both online and off. Create a strategic book marketing plan for reaching readers. Learn to blog, leverage social media, and share content that people care about. Walk away with the relationships you need to build your author platform. This course is for writers of all types who are serious about finding their readers NOW. What she means is that these writers were disappointed because after years of hard work in writing and publishing their book, only a few dozen books were sold. That no one cared about their book. With so many more books being published each year; with publishers overwhelmed with the many titles they produce; it is increasingly up to the writer to learn how to connect their writing to readers who will appreciate their work. 6 career-shifting lessons that take you step by step through the process of how to develop your author platform. 6 Exclusive Insider Calls, where I get on the phone with the entire class and you can ask anything. Here you have a chance to brainstorm ideas; dig into specific challenges you are trying to move past; and build close relationships with myself and the other writers in the course. All Exclusive Insider Calls are recorded, so if you miss a call, you always have access to the recording. The only thing you need to participate in the course is a web connection and telephone. Every Wednesday, you are given access to a new lesson in text/image/video formats. Throughout the course, you go through 6 powerful lessons taking you through each step of developing your author platform. (more on these below.) At the midway point in the course, we take a week off. This is done to give you a chance to do some research, give more critical thought to what you are building or catch up if you have fallen behind at all. Each lesson ends with a homework assignment which is due the following Monday. I provide in-depth feedback within 48 hours. Every Monday at 3pm ET, we have our Exclusive Insider Calls, where the class speaks via conference call. This is an hour-long conversation where you can ask me anything, and get feedback from other members of the class as well. Everything is recorded; if you miss a call, you have access to an MP3 recording of it to listen to anytime. You can also send in questions ahead of time for me to address on the call. If you miss any call, don’t worry. Everything is recorded and available for playback. I’ve had folks go through this course and never attend ANY live calls and still say they received AMAZING value from the lessons, recordings and homework alone! Many authors want to wait until their book is finished, feeling they will then have time to develop an audience. But trust takes time; there is a learning curve; and the best audience is one that you develop slowly, one person at a time. There is no magic button to give you an audience when you need it. Crafting your platform is a skill that you develop, just as Rebecca and other bestselling authors have. Begin today. The 6 lessons provide a step by step process to develop your author platform, and the full course ensures you have feedback to ensure we work through challenges and roadblocks that you may be facing. Each week provides another building block that addresses a critical aspect of growing and connecting with your audience. Objective:Focus your efforts to clear goals and actionable steps to reach them. This includes both short and long term goals. We review your existing online author presence to gauge where you stand, what resources you have to work with, and where you need to start from scratch. This is about simplifying. Key Topics: Analysis of your existing author presence; Your experience and credibility as an author; Your long terms goals as a writer; Your short-term professional needs. Objective:Define what it is your work stands for, and determine how to communicate that to others. We dig into how your value connects with the needs and desires of your audience. Key Topics: Establish your brand message; Review keyword research tools; Create keywords for inbound and outbound marketing. Objective:Identify where communities exist that align to your brand. These are not just places that you are targeting your marketing efforts, they are groups of like-minded people who you can help, and who can help you. Your brand will not be established by crafting a perfect marketing message that you will broadcast, it will be created by authentic interactions within these communities that focus on the good of the whole, not just your own goals. We review how to learn what works by watching how others interact and how they share content via social media and the web. Listening is your most powerful tool because it gives you keen insights into the needs and desires of your audience. You will begin identifying how you can add unique value to the community you are targeting. The goal is not to create your writing and then try to sell people on it, but understand what engages people and create your branding around that. Key Topics: Identify groups, communities, and individuals who align to your purpose and goals; Analyze what networks matter most to these groups & people; Conduct market research to understand the purpose & goals of others; Learn who is leveraging online networks most strategically; Discover the influencers within these communities; Research methods to identify engagement strategies; A primer on using web analytics; How to blend online and offline research methods; How to learn the unwritten rules of your community by observing what others do. Objective:Build or optimize your online presence. We choose which online services to join and craft your profiles on each. This is the first step in putting your brand message out there. These are the building blocks for interaction, helping, and growing your credibility and connections. 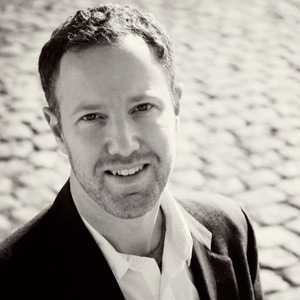 Key Topics: Selecting online social media services such as Twitter, Facebook, YouTube, etc. ; Secure domain/screen names; Create profiles for each; Consider how your online presence will help people engage and interact with you – giving them easy ways to understand your purpose, and how to learn more about you; This is about creating unique value and building an authentic presence. Objective:Create engaging content and get involved: this is where we take preparation and theory into the real world of interacting with others. We review best practices for online content creation, and how to connect all content types (long form, social updates, blogging, video, audio) to your brand story. We establish search engine optimization writing practices, and set you up with a structured content strategy and editorial calendar. Worried that you don’t have enough time to manage an author platform? This is where we share tips on how to manage it all. The goal is to bridge the gap between simple things like Tweets to your larger goals. It’s all about building interest in you and your work via authentic psychological cues. Key Topics: Writing for the web best practices; Search engine optimization practices for writers; How to create a mindmap; How to create an editorial calendar; The value of partnerships; Guest blogging; How to create a newsletter and newsletter list; Marketing tactics for major platforms; How to create structured marketing campaigns. Objective:Create sustainable workflows for further establishing your brand and increasing your network in the communities you serve. Setup performance measurement and review how to iterate online strategies to ensure consistent growth of your online presence. Of course, this is all about how to get the maximum benefit for your efforts. Key Topics: How to set benchmarks; how to use web analytics; the value of measurement and iteration. I realize that you may be apprehensive about the cost involved, or the time it will take to develop a readership for your audience. After working with hundreds of writers, I firmly believe that this course delivers incredible value in the quickest amount of time. To hire me for one-on-one consulting would cost thousands. Likewise, many writers try to build their platform in fits and starts, and after years of effort, they find themselves stuck in the mud. I work with you to outline a strategy that focuses your efforts on the thing that matters most: truly connecting with readers. This does not require you to be an extrovert, to become a marketer, or to do things you are uncomfortable with. In fact, the best way to engage readers is often as exactly who you are, even if you consider yourself an introvert. This is more than 5-hours of exclusive advice that is not available anywhere else. The moment you register, you will also receive the 72 page Author Platform Starter Kit PDF ebook. This is an instant download that frames the core ways to consider the value of your author platform. The ebook will shift your mindset to best prepare for the course – providing an overview of methodology we cover throughout the 6-week course. I am passionate about ensuring students make an investment in their writing careers that connects them with their goals. If you sign up for the course, and within the first week, are not satisfied for ANY reason, just send me an email, and I will provide a full refund. This means you have 7 full days to try out the course, go through the first lesson, chat with other students, experience the first call, and be a part of everything else it offers. At day 7, if you realize this isn’t for you, I will gladly refund your money. It literally costs you nothing. I assume all risk here because I want you to feel you have made a choice that will put you on the fast track to developing your author platform. I have worked with hundreds of writers, and firmly believe that my role is to HELP you reach your goals, and ensure that you make the most of your resources. Have any questions at anytime? This is my cell phone number: 973-981-8882. Just call me and ask. (but please call at a reasonable hour, I have a 2 year old at home!) I don’t see many other instructors giving out their personal cell phone number before, during or after a course. That is how much I believe in helping you. The full course includes the 6 lessons, plus 6 Exclusive Insider Calls with me, detailed feedback on your homework, and access to the forum. The total cost is $799. To register, you leave a $50 deposit, and then the rest of the balance is billed in 4 payments throughout the course. 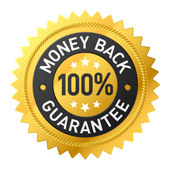 There is also a 100% money back guarantee. There is literally no risk on your part. This is an incredible investment in your writing career, providing not just the skills, but the relationships you need to succeed. Limited space is available in this course – I keep class sizes small to ensure each student gets individualized attention. Join me, a group of passionate writers, and publishing experts to begin building your audience now. 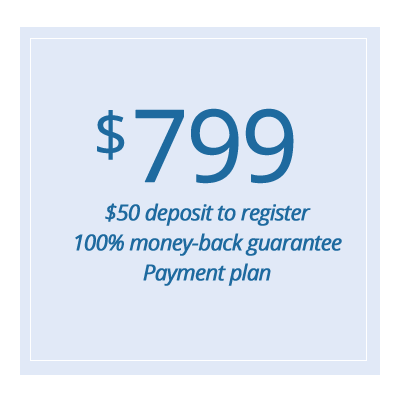 It takes just $50 to register, and I offer a 100% money-back guarantee. You will receive the Author Platform Starter Kit when you register. Are you ready to find and engage your audience? Join us today. When you sign up, you will immediately receive the 72 page Author Platform Starter Kit. As we move toward the start date, you will receive the Author Platform survey so that I can get a sense of your personal goals and existing author platform. The forum where you can begin meeting the other writers in the course and interacting with me. Access to the Guest Expert interview library.